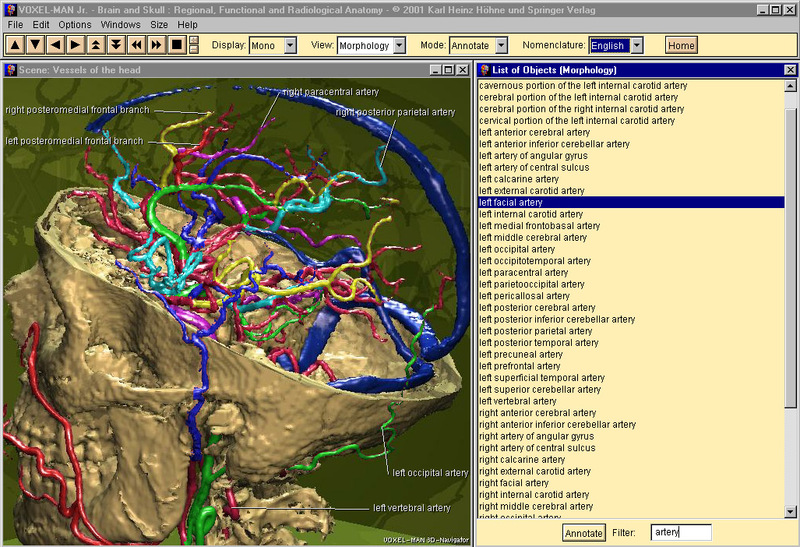 Unlike books or traditional multimedia programs, it allows interactive exploration of a detailed three-dimensional anatomical model. Each structure is labeled and described, and can thus be interrogated directly on the screen. The advantages of dealing with real anatomy are thus combined with the advantages of learning from a book (associated knowledge). 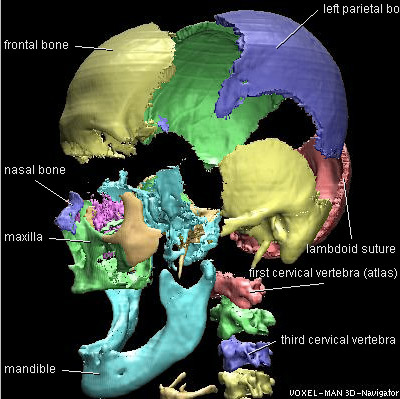 Unlike traditional sources of knowledge, VOXEL-MAN 3D-Navigator presents the radiological manifestation of normal anatomy in the context of three-dimensional anatomy. It thus decisively improves the understanding of both X-ray and cross-sectional radiological images. 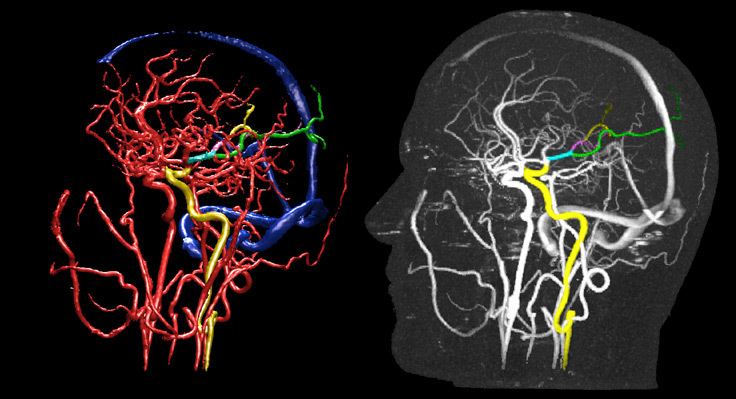 The program is based on various body models, built on cross-sectional images obtained by computer tomography and magnetic resonance imaging. 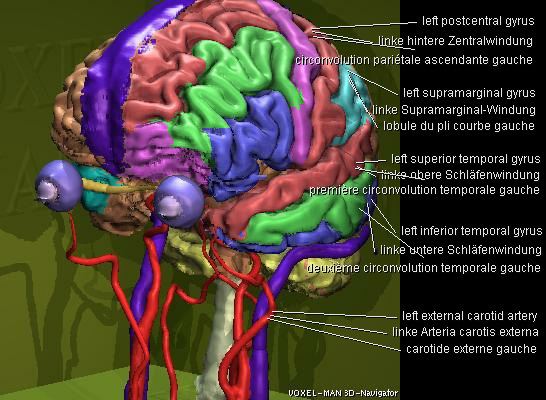 It contains more than 250 three-dimensional anatomical objects. In addition, images from the Visible Human were used. 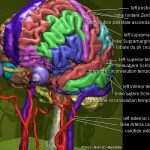 The skull and the brain with its constituents, functional areas, vessels, and blood supply areas may be investigated in 36 interactive scenes, 18 of which are also available in stereoscopic (red/green) format. Using the mouse, the scene may be rotated, and objects may be added or removed. Furthermore, anatomical objects may be marked, searched for, painted, annotated, or described. Anatomical objects to be manipulated may also be selected from an object list. A textual instruction illustrates the possibilities available for the chosen scene. The radiological manifestation of the objects can be viewed in the context of 3D anatomy. 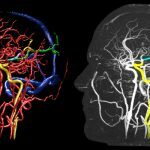 This includes simulated X-ray images, as well as maximum intensity projections and cross-sectional images from CT and MRI. 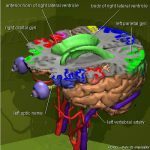 VOXEL-MAN 3D-Navigator: Brain and Skull is a multilingual system: The anatomical nomenclature is available in Latin, English, French, German, and Japanese (French and Japanese only for the brain without vascular system). For English, German and Japanese Windows systems, the user interface automatically adapts to the respective language. A manual is available in English and German. 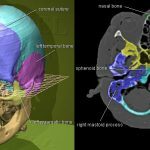 The program provides unique reference material not only for medical students, but also for professionals in all medical disciplines involving anatomy and radiology. 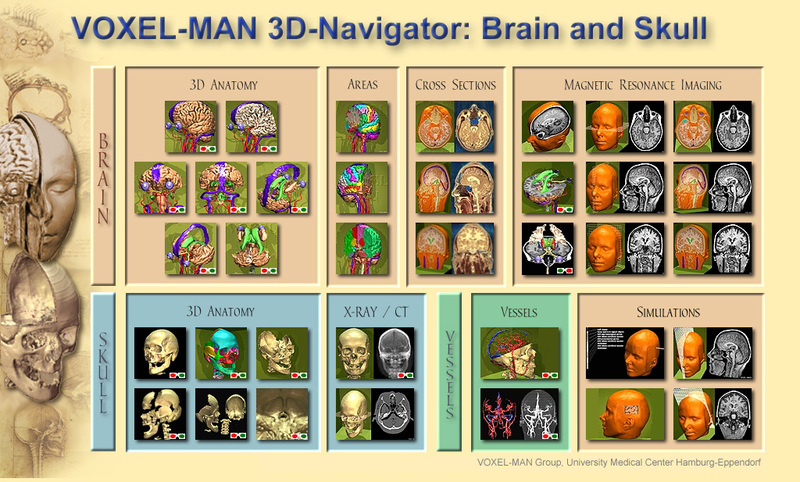 However, also non-specialists can explore the inner structure of the human brain and skull using VOXEL-MAN 3D-Navigator. 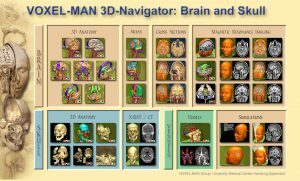 Voxel-Man 3D-Navigator: Brain and Skull was originally published in 1998 by Springer-Verlag (as Voxel-Man Junior: Brain and Skull), with updated versions published in 2001 and 2009, respectively. Since 2018 it is available for free under a Creative Commons license. 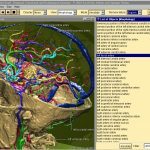 Karl Heinz Höhne, Andreas Petersik, Bernhard Pflesser, Andreas Pommert, Kay Priesmeyer, Martin Riemer, Thomas Schiemann, Rainer Schubert, Ulf Tiede, Markus Urban, Hans Frederking, Mike Lowndes, John Morris: VOXEL-MAN 3D Navigator: Brain and Skull. Regional, Functional and Radiological Anatomy. Version 2.0. Springer-Verlag Electronic Media, Heidelberg, 2009. (DVD, ISBN 978-3-642-01211-2).